Every once in a while, a leisurely brunch with mimosas or Bloody Marys is a necessity. Last Sunday I slept in late... like really late, and decided against spending what was left of the day dashing around the city. 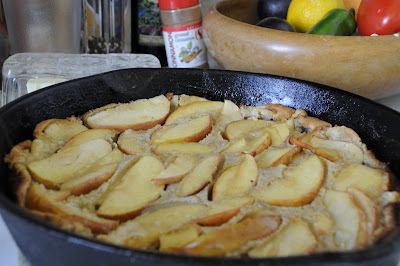 What better than to make my mom's delicious apple pancake with a mimosa or two? Apple pancake is a dessert posing as a breakfast recipe in my opinion, but its sweetness is balanced by the wealth of fresh apple. Since it's a family recipe, I'm only offering it per email-request, so send a line if you're interested. 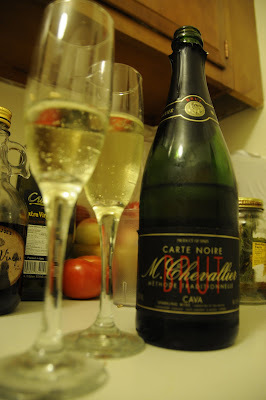 As for the sparkling wine, it was another Trader Joe's selection; this time a M. Chevallier Cava Brut around four or five dollars. M. Chevallier Winery is located in the Penedes region in Catalonia, Spain. Cava can be viewed as the Spanish equivalent of Champagne in France, but unlike French Champagne, some Spanish Cava are created outside the Penedes region. Cava was actually labelled "Spanish Champagne" until EU law prohibited it. The Spanish Denominación de Origen demands that Cava only be produced in six regions and only by traditional methods, including a second fermentation in the bottle. The regions where Cava is created have a cool climate that traps the acidity needed to craft a fine sparkling wine. 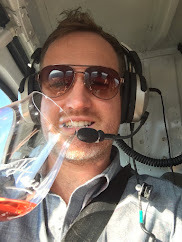 The locals noticed this but it wasn't until a phylloxera plague killed many of the red grapes in the region in the late 18th Century that the climate was taken advantage of. Oddly enough, though the region uses traditionally French methods of producing sparkling wine, it did not use Chardonnay grapes until the 1980's. To ensure that you're drinking true Cava, take a look at the cork and make sure it has a four pointed star on it. I forgot to check my bottle, but I thought the sparkling wine was everything I wanted from a cheap bottle. If not lacking character, M. Chevallier's Cava was pleasantly quiet, not too bubbly, dry, and left a clean finish. Plus, since I know that Cava should be drunk young, I couldn't go hanging onto it any longer. I highly recommend this sparkling wine for mimosas or for large events.